Pre – Set Pressure : up to 6 kg/cm. Head : 20 ~ 50 m.
Features: Constant and stable pressure control, Dry – run protection, Automatic stop when flow stops, Pressure compensation for pipeline leaks, Single or parallel unit operation, Interchangeable operation. 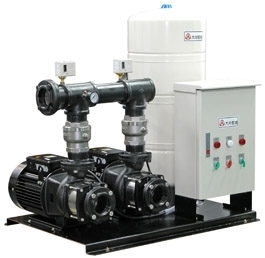 Application: Apartment buildings, houses, villa water supply, factories, water supply system, drinking water systems, RO water treatment equipment, supermarkets, motels, SPA, etc.